The Canon imagePROGRAF marketing message is as clear as a Canon L series lens: Photographers who use a Canon body and lens combination should be equally obsessed with print quality, and the ideal solution is a Canon imagePROGRAF PRO Series printer. For those of you Canon shooters or fine art reproducers using Canon EOS camera bodies and L lenses, looking at these printers will seem like déjà vu. Canon used the same jet black textured surface found on its pro cameras, along with red line from the lenses (symbolizing the highest quality) through the front of the new 24-inch and 44-inch imagePROGRAF PRO Series printers. Now you can set your camera on top of your printer and they will match beautifully in both aesthetics and output quality. This new Canon technology got a makeover both externally and internally, so I’ll cover as much as I can to inform you of what’s new. 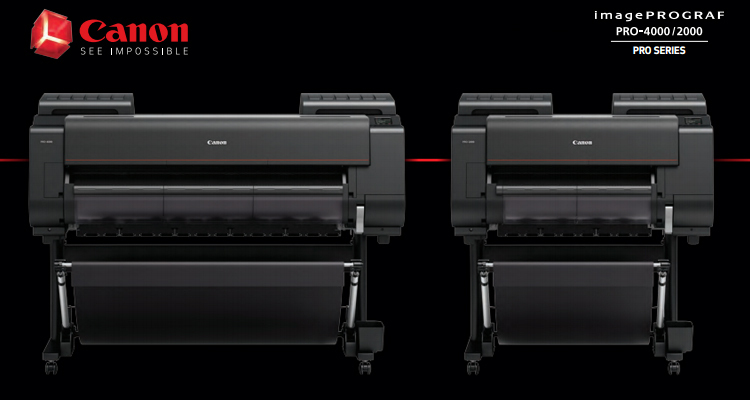 Canon has released its fifth generation printer in the new PRO-2000 and PRO-4000 Series. The new printers contain an all-new ink formulation, which includes 11 colors plus a new Chroma Optimizer: red, blue, photo black, matte black, photo gray, gray, cyan, light cyan, magenta, light magenta, yellow and Chroma Optimizer. You may ask, what can an optimizer do for me? For starters, you don’t need a microscope to see how the optimizer works. By laying down an optimizer, you are creating a clear layer on the top of the pigments that allows for more equal light refraction across the surface of the print. This, in turn, gives you more durability on the print surface against abrasion and a very uniform gloss level from edge to edge on photographic papers. The new Print Studio Pro software offers the choice to cover the entire print with optimizer or use it in selected areas where the printer determines it’s needed. My preference is across the entire print to visibly create an overall uniformity to the print. The optimizer is turned on when you are using photo black ink only. Matte papers do not require it since there is no light refraction issues on matte surfaces, so it is turned off when you choose matte media types on the printer. For previous Canon users looking to add the newest technology, you’ll be happy to know that in the new machines there is one less print head to replace as a consumable. What was done using two PF-05 print heads ($450 x 2 retail) is now done, and done better with the all new PF-10 print head ($675 retail). How is one better than two? Less overall replacement cost is just scratching the surface of the benefits of this latest release. On the print head itself, Canon has included sensors at the top middle and bottom of their print-head channels to help control the flow of traffic and get more accuracy with the drop placement. With two print heads, they averaged 32 million ejections per second. Now, one print head can eject 33 million times per second. Why do you need to know this? Technically you don’t. What you should take out of this nerd jargon is that this single PF-10 print head is not only outputting the same work faster than two print heads, it’s also laying the drops down more accurately with less spatter than before. By looking at the microscopic comparison, pictured above, you’ll see what I mean by spatter. The change in ink encapsulation and the change in the PF-10 print head allows the print viewer to realize VISIBLY sharper detail and definition even in the hardest of places on the print — even from normal viewing distance. By moving to one print head, Canon was able to shave some width off of the PRO-2000 and PRO-4000 printers. Does saving an entire foot of studio space sound good to anyone? Square footage is hard to come by especially in heavily populated cities or in smaller business footprints. The PRO-4000 (44-inch printer) is a full foot smaller in width than the prior generation. The PRO-2000 (24-inch printer) is almost 6 inches smaller. Both have a redesigned chassis that creates a more stable print platform on the inside, which also controls the accuracy of the print. By adding an optional Multifunction Roll system to either 24- or 44-inch machines, Canon is the only kid on the block with the ability to run two rolls at once or run a roll-to-roll take up or reverse curl your thicker fine art media. Load a matte fine art paper on the top and a metallic paper on the bottom. The printer auto selects the roll by the settings you choose in the print dialog from the computer. It will automatically feed the correct roll to print to into the printer based on your media settings. How about a nice flat print to the thickest fine art paper you have on your shelf? Attach it to the take up and reverse the media take up so it rewinds against the curl. Print out your jobs, wait 10 to 20 minutes, chop and ship flat! Canon has included several free powerful software tools to help boost productivity, profitability and ease of use with its machines. Canon decided to substitute the imagePROGRAF Print Plug-In with the new Print Studio Pro software. This new software works similarly to the plug-in, but allows the user to select from more options at the time of print, and also allows for access from Adobe Lightroom. Watch our tutorial videos to get a preview of all of these free tools, which include an all new Print Studio Pro, Media Configuration tool, Accounting Manager utility and Layout Plug-in for Print Studio Pro. Not to mention a big plus for Mac users: Accounting manager now works on Mac platforms as well as PC. If you have a Canon and you’re not using the Accounting tool, watch this link for the past versions and this link for the new Pro Series. A few unexpected changes surprised me in a good way. Canon went from a button-operated panel to a touch-screen interface on the actual printer. This works very well, and that’s coming from a guy who has rather large fingers and hates most touch screens. An added USB accessible port on the printer means you can print directly from a file directory located on a portable USB key without turning your computer on. You have the option to print at the native file size or expand the image to the width of the roll. There is also a brand new adjustable paper catch unit that is very cool. It can be positioned several different ways to accommodate for stacking, canvas or just your everyday catch unit. Canon also made it easier to install on both the hardware and software side. I deal with install questions day in and day out on the prior generation, so this is a big plus. You can find all the software you need in one nice, neat little package install program. PHEW! What a relief. Also, hardware install including the Optional Roll unit is so simple. You will still need an additional body or two to lift the weight of the machine onto the stand, but the process is much faster to get up and running than before. Wireless connectivity was also a new accessibility addition where you can access the printer via a Wi-Fi signal sent from the printer. No router is necessary to connect to the printer with this option. It seems the overall focus was improving image quality and accessibility. I’m a big fan of the addition of the optimizer into the ink set. When you can place two prints next two each other from two different printers, old vs. new, and visibly see a sharper, smoother, more continuous tone appearance to the print, I’d say that single benefit alone should sell a lot of printers. Canon already had speed and the new printers are still just as fast. I’ve found with Canon you know you’re going to get a user-friendly platform that is extremely low maintenance and provides a museum-grade print permanence and quality. Now you have more added options for productivity, an even better quality image and a machine that takes up much less space. If you have never owned a Canon printer and are looking to purchase one, the learning curve is very straight-forward. If you ask anyone looking to add a printer to their current line of Canons, they will tell you that Canon gives you more tools than most manufacturers of equipment to process images. That equates to a happy consumer able to plug, play and make money right from the start with their new purchase. Going on 10 years with LexJet, Michael has played an integral part in sales of wide-format printers. Having amassed extensive product and application knowledge, Michael was named the head of LexJet’s “Experience Center” where customers can gain knowledge of wide-format printing with all technologies and applications. He is also a team leader in charge of LexJet’s Tech Support and installation division.